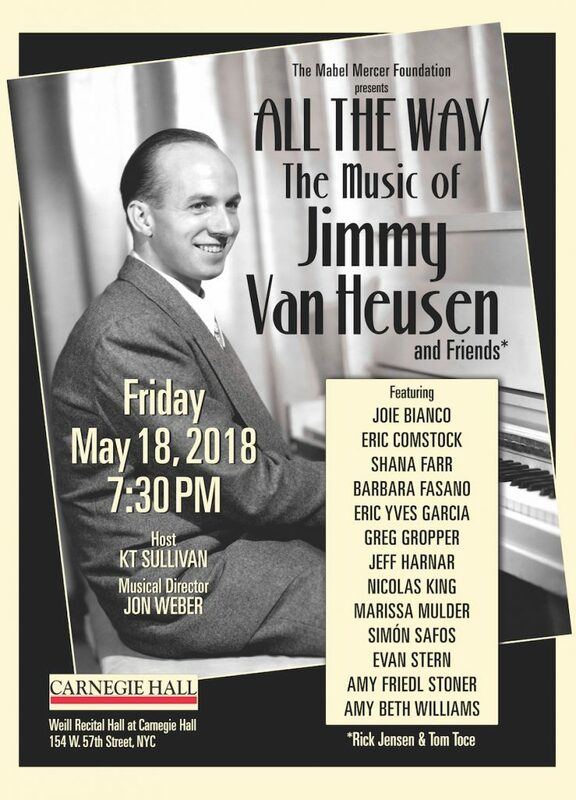 The Mabel Mercer Foundation presents All The Way: The Music of Jimmy Van Heusen & Friends, hosted by KT Sullivan. The evening features classic songs by Jim Van Heusen including “All The Way”, “Imagination”, “Come Fly With Me”, “Call Me Irresponsible”, “Here’s That Rainy Day”, “But Beautiful”, and “Polka Dots and Moonbeams”, among others. The performance also features songs by composers who have expanded the standard cabaret repertoire, including Rick Jensen and Tom Toce.